Looking for Lexmark C540 Parts? Ultra-compact and exceptionally quiet, the Lexmark C540n offers you true 1200 x 1200 dpi color printing to liven up your business documents, plus rapid print speeds as fast as 21 ppm in both black and color. Make a big impact on your business with a color printer that is genuinely desktop-friendly. With their small, attractive new design and quiet noise level, Lexmark's new color lasers will be welcome additions to your desktop or small workgroup. Add professional color to your documents. Lexmark gives you the tools to control color output and puts its color expertise to work for you, so all your brochures, reports and graphics come out vivid and accurate to the finest details. Lexmark's C540 Series gives you a rapid first-page-out and races through your print runs at blazing speeds. What's more, these printers offer you the versatility you need to keep up with your demanding office printing needs. Printing responsibly means everyone wins, your business, your budget and the environment! 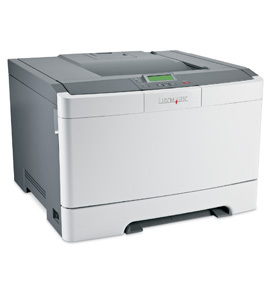 Lexmark's C540 Series is eco-designed and comes with a vast range of features to help you print greener at every level. High Yield Cartridges, Lexmark Cartridge Collection Program and end-of-life product recycling help reduce waste.